I am so excited to announce I have found a new tech. To add to my excitement I found her on the site I created, the Society of Nail Techs. I created this site for nail techs to network and grow -- how amazing is it that one of the techs who joined was about 20 minutes away and looking for a salon?! The site works and networking works. She contacted me and we met this week. In our meeting her goals and mine seem to be on the same page. Her name is Joii, and in my next post I will have a photo and more information. Also the Society of Nails Techs has 120 members and growing. I am so excited! We have techs from all over the world, literally. I had to share the news with the readers of the blog. I'm growing my salon Upscale Nail Bar and The Society of Nail Techs everyday. 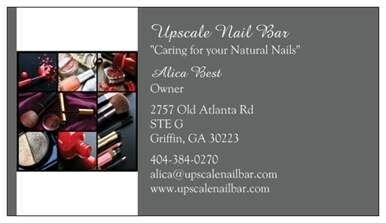 —Alica, Upscale Nail Bar & Boutique, Griffin, Ga.